Enter the mysterious town of Moonlight Falls where strange things happen by the light of the moon. Create supernatural beings from menacing werewolves and cackling witches, to mischievous fairies and more intriguing vampires. Then stalk the night, use your wand to cast spells, claw the furniture and more. You can mix dozens of elixirs that can turn Sims into zombies or transform them into gold. Share your enchanted brews with any friends who have The Sims 3! 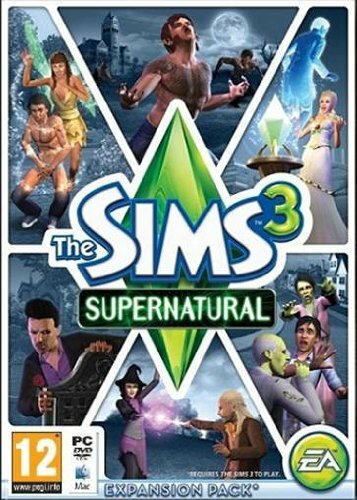 Spooky surprises are in store for you in the world of The Sims 3 Supernatural! Hone your magical crafts and share the enchantment: Learn to cast spells and find rare ingredients to brew elixirs, so you can charm or hex your Sims’ lives. Send your magical elixirs to any of your friends’ games who have The Sims 3. Your Sims can hone their psychic abilities and build a career as mystic fortune teller. Deck out your home in gothic style: Add a secret lair with the sliding bookcase door.